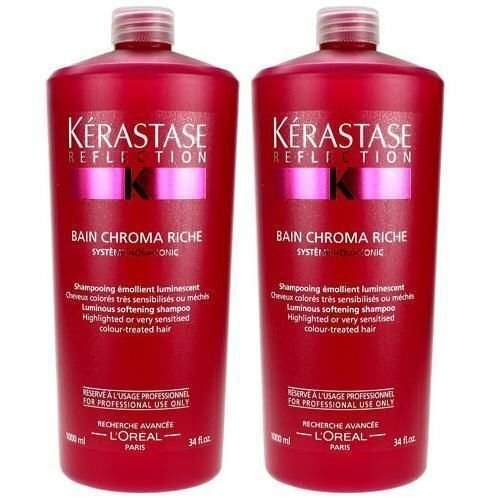 REFLECTION BAIN CHROMA RICHE Bright bathroom for very sensitized colored hair and / or fuses. APPLICATION Distribute on wet scalp and hair. Wash with a gentle massage with the tips of dedos.Aclarar. Carry out a second application and leave on for 3 minutes. Wash to develop lather and rinse thoroughly with warm water. You can use the day of coloration and between two colors. TECHNOLOGY: AQUA-IONIC SYSTEM Micro-rush light refractors fibra.Tejen fill the emollient film around a hydrophobic fiber. UV filter protects the color photo-oxidation. Vitamin E protects the fiber for its anti-free radical action and blocking its degradation. RESULTS Unify cabello.Brillo surface, polished hair. Protection anti-degradación.Color more vivid and intense. Hair nourished, emollient, soft, loose and disciplined.